A Northern Ireland council’s mistake involving an apostrophe is reported to have cost ratepayers over £1,000. 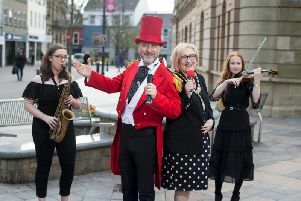 Armagh, Banbridge and Craigavon Borough Council’s grammatical error appeared on series of adverts (pictured above right) for a performance of Charles Dickens’ Great Expectations in Banbridge. The event was held on July 21 at Solitude Park in Banbridge and although it was free to attend it has ended up costing ratepayers £1,200. The promotional material billed the show as Charles Dicken’s Great Expectations – an error which forced the council to reprint its promotional material. The reprinting of the material cost around £1,200 which included £140 on correcting 48 sheets, £95 on delivering additional leaflets, £295 on reprinting advertising boards, £332 on flyers and posters and £290 on a window vinyl. An ABC council spokesperson said the misplaced apostrophe was “due simply to human error”. They added: “Discovering the error, we weighed up whether or not to replace the material and, given that the event was a celebration of such a literary giant and in line with our own commitment to best practice, decided that it was the right thing to do.